Legends tell of brave champions whose unwavering faith earned them the favor of the gods. Empowered by the might and magic of their deity, these devoted characters transcend the realm of mere heroes. This supplement for the D&D® game provides everything you need to create divinely inspired characters of any class. Along with new base classes, prestige classes, feats, spells, magic items, and relics, Complete Divine also provides guidelines for incorporating religion - from mysterious cults to powerful theocracies - into your campaign. To use this supplement, a Dungeon Master also needs the Player’s Handbook, Dungeon Master’s Guide, and Monster Manual. A player needs only the Player’s Handbook. 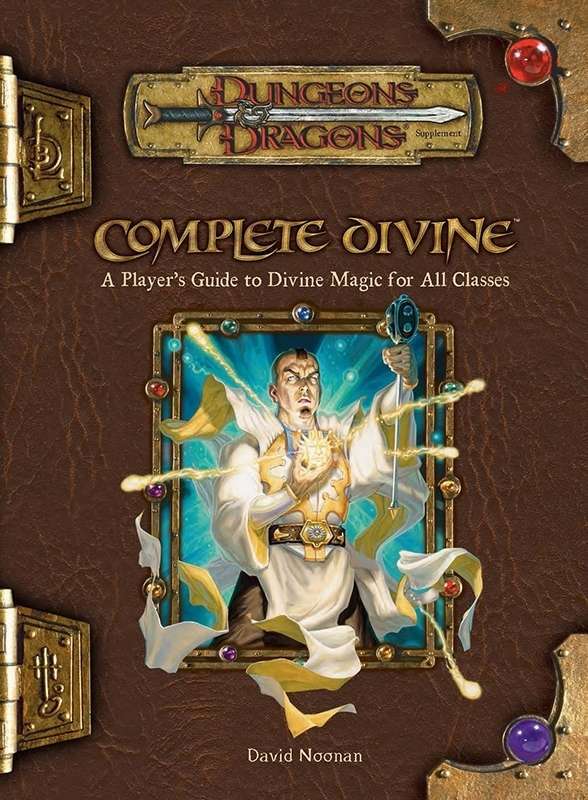 Complete Divine (2004) is essential reading for players of divine spellcasters in 3.5e D&D, particularly if you don't already own the previous divine supplements from 3e. The book provides more than 20 prestige classes and a number of techniques for differentiating and expanding divine characters. New Core Classes. The new and converted core classes in Complete Divine include the “favored soul,” the divine equivalent of a sorcerer who casts spells spontaneously; the “shugenja,” an element-linked divine spellcaster; and the “spirit shaman,” a variant druid with a spirit guide who casts spells spontaneously and balances the ability to retrieve different spells each day with having relatively few known spells. Will You Convert? The chapter on prestige classes features several entirely new classes. There's the “black flame zealot,” featuring fire worship; the “evangelist,” allowing divine characters to convert their foes instead of kill them (a typically tricky act to model in most D&D games); the “entropomancer,” a cleric who worships oblivion and manipulates the shards of a sphere of annihiliation; and a few others. Rules conversion is generally well-handled and straightforward, with the possible exception of the “Radiant Servant of Pelor,” a healing-focused prestige class that is generally considered to be rather overpowered without some further adjustment by DMs. As in previous Complete books, NPC stats for each prestige class are provided, allowing DMs to quickly grab one for use as a foe: just add name and personality and you're ready to go. Feats of Clay. Well, not of clay, perhaps, but of the wild. The chapter for supplemental rules expands on the concept of “wild” feats introduced in 3e's Masters of the Wild, with some feats allowing the druid to to use an animal's power regardless of their current form. Spending one use of wild shape in exchange for gaining an eagle's wings, for instance, is an ability that hadn't previously been granted to the druid, and it makes for some fun tactics. Practiced Spellcaster (the feat that makes multi-classed spellcasters viable again) is included, as are feats that can change “turn undead” attempts into fast healing. Another variant, “faith” feats, are presented as an optional rule, where PCs who perform pious acts are given points to power the feats. It's an interesting concept I'd like to see explored more. Relics. Relics are fascinating, powerful, and flavorful new items that require their user to be sworn to a specific deity. If you want to model the feel of a saint's mace being handed down through the church from generation to generation, finally being granted to a dedicated PC, this is an excellent method for doing so. One quibble, though – in order to unlock access to these items' powers, PCs must first take a feat called True Believer. That's a tough request in a game where typically feat-poor divine characters have to spend a precious feat in order to use a magic item that they might not be able to keep for their entire adventuring career. The Gods of D&D. The chapter on deities focuses on the gods of Greyhawk as presented in the Player's Handbook. Temples, relics, rites, and quests for these gods are detailed, along with lists of other less prominent deities from Greyhawk and their portfolios. This chapter is less useful for any DM who is not running a campaign using the game's core gods. It still serves as a good example for home campaigns, however, and it isn't hard to build a pantheon by stealing the information here and filing off a few serial numbers for a newly created home campaign. More useful is the chapter exploring the divine world, discussing what happens when you die and also showing the DM how temples and theocracies are structured. This chapter is quite useful for anyone wishing to expand the role of religion in their game but who isn't sure where to start. Spells Aplenty. Where would a divine supplement be without new spells? New and reprinted cleric domains are occasionally quite creative and flavorful: examples include Competition, Dream, Force, and Madness. New spells are balanced and generally interesting, with new fodder for druids and paladins as well as clerics. About the Creators. David Noonan has worked on d20 Past, d20 Future, and on over 35 different products for 3e and 3.5e D&D. He is currently a lead writer at En Masse Entertainment.